First of all, we only use “bulaklak” from pigs slaughtered in our own in-house licensed slaughterhouse facility. In other words, we have control from pig to plate. They are carefully washed and cleaned, then boiled with seasonings and readied for the deep fryers. 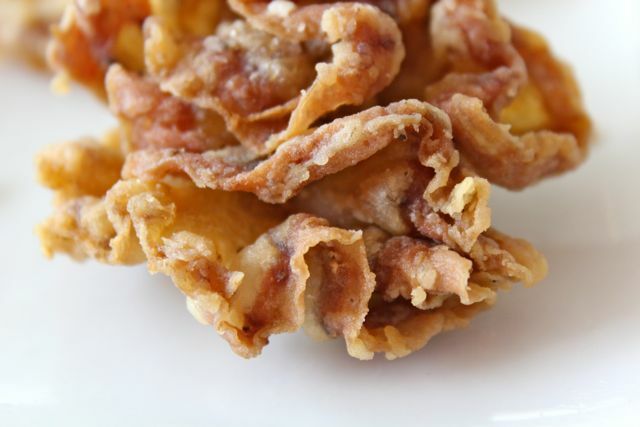 Seasoned and fried to order, they are a huge hit amongst regulars, and even I can occasionally have a piece or two with some chili vinegar and a bottle of beer… :) We only slaughter so many pigs a month, so we only have a limited amount of chicharon bulaklak in stock. When we run out, we do not purchase from other purveyors, to ensure the quality and cleanliness of the innards. Enjoy! Wow, another item to look forward to on my great Cebu trip in September! Looking forward to this… pagkarating na pagkarating pa lang! 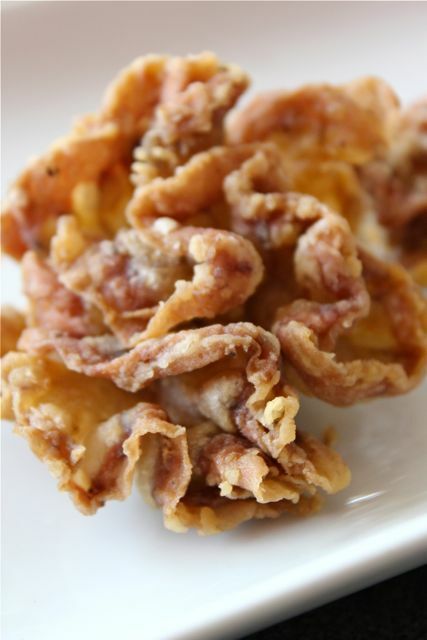 Zubuchon cooks the best chicharon bulaklak! This has become a staple in our every visit! Your version has a lighter color than the commercially sold ones that are brownish-grey. Looks very appetizing. Am sure it taste much better than it sounds – “to ensure the quality and cleanliness of the INNARDS”. HA HA HA. I wish I could have it right now. Chewing and swallowing while looking at the picture even though it’s my first time to see it. It really tasted good! it’s calling me, it’s calling meeeee…. The perennial partner of the palesen. Also a slam winner with bahaw! Yes @Jay Salanguste, just what is there in bahaw (or kaning lamig, down our way) that makes it a perfect match with greasy treats such as the above or okoy? now i’m craving for chicharong bulaklak! In our household, we use chicharong bulaklak as a topping on batchoy tagalog. Now i’m craving! I read part of the title as ‘deep-fried dysentery,’ and chuckled at how that could be an apt description of cause and effect for this food. I just came from Cebu and have visited your branch at the airport and I must say, nicely done! We didn’t get the chance to eat at the other branches during our stay and just thought of buying some lechon at your outlet in the airport. But lo and behold was a full-on Zubuchon eating spot. I was excited to try out the dishes on offer and got the Champorado and I was really happy with it because it didn’t skimp on the cocoa. It reminded me of my lola’s champorado :) I also bought a frozen chorizo to be used here in Manila. MM, how many kilos would a medium pig have of this mesentery? Dont sleep right away after indulging on this… Mr Gandolfini had Foie Gras prior to his demise I heard.. This is just as bad and delicious!! I love chicharon. I wonder if I inherit it from my Mom’s taste bud. My Mom is 82 years old now and she’s always craving for chicharon in any form. Kahit pa nastroke na, paminsan minsan nagpapabili pa rin ng chicharon. I told her hinay hinay lang Mama!! I remember my godfather Ninong Kiko with a chicharon store in Evangelista St, Makati in the old days. Love his chicharon bulaklak. Oh i missed the chicharon bulaklak =(. We were there last May. My American Fiance loves your Lechon and Kalamansi shake. The moment we arrived at Cebu, i pulled him to look around but did not tell him i’m aiming to look for Zubuchon Branch! I was jumpin’ like a kid when i saw your branch @ One Mango Mall. Bought 5 Kalamansi and 1 Mango Marmalade even am not sure how much extra weight i have =). When we reach the airport got a kilo of frozen lechon. I must say “Mission accomplished”!